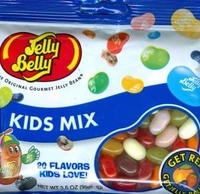 Jelly Belly Kids Mix Jelly Beans. Jelly belly has come out with this mixture of jelly bean with Kids in mind. You get a variety for flavors like Berry Blue, Bubble Gum, Butter Pop Corn, Chocolate Pudding and Cotton Candy. The perfect jelly bean for kids. Although the assortment name of these Jelly Belly Jelly Beans are kids mix, don't let that fool you Adults love this mix also. Each bag is 3.5 oz and has 20 assorted flavors.